The Montbéliarde originates from the Haute SaÔne-Doubs region of France, they are descendants of the Bernoise breed and were previously called the Alsatian breed . The Montbéliarde is renowned for its milk traditionally used to produce Emmental and Gruyère cheese. The Montbéliarde is of similar colour to the red and white Holstein. They have a white head and light muzzle. They are renowned for having strong udders and tough feet. 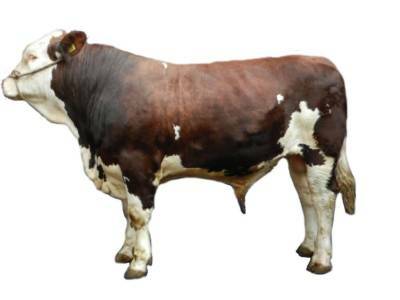 Cows are around 135 – 140 cm to the withers and around 685 kg, the bulls are around 148cm and 1,100 – 1,200 kg. Their milk is of excellent cheese making quality (Gruyere) because of its high protein content & high frequency of Kappa Casein B variants.